Notes: I think I’m a bagel prude. I like my (never raisin and never ever blueberry) bagel with cream cheese and, if I’m feeling especially sassy, maybe tomato. 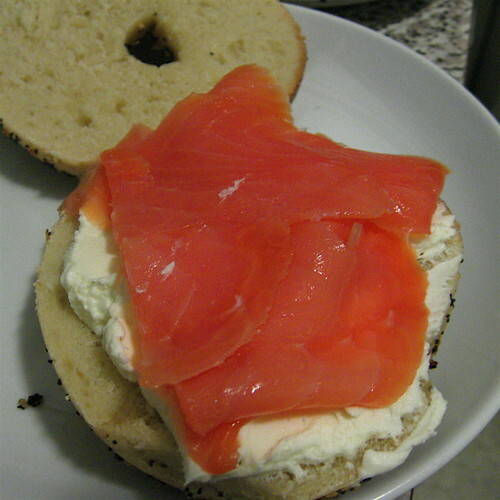 So, I stuck with the basics here: bagel, cream cheese, smoked salmon. Anyway, I’m from an almost totally goyim town, so maybe you’ll understand why I had never eaten smoked salmon before this salmon I bought at Zabar’s yesterday. Sweet fancy Moses, it’s like… Kosher bacon. Fatty, smoky, salty — if G-d told me bacon was off-limits, this would be the first place I’d turn, too. I think the Zabar’s salmon was especially good, as even my husband said it was the best he’d ever eaten. Rating: Fifteen hours after eating this, I already want to eat it again. That’s not dinner! That’s sunday morning breakfast! Okay, so sometimes it is dinner. Or lunch. Or a snack. Or, if lox can be had for a decent price, 2 or more of the above. If you have any leftover lox (I know, the idea is nearly unthinkable), try it in an omelet. I had that at Murray’s recently with a visitor. Lox is oh so good. But you know what REALLY made the sandwich in my mind was the sliced tomato and red onion. The tomato provided some brightness and a little bit of sweet to balance the heaviness and salt of the lox + cheese, and the little bit red onion both cut through the pungency of the salmon *and* enhanced it at the same time, if that’s possible. I’d be really interested for you to try the sandwich with those two (IMO indispensable – I’ll never go back to without) extra ingredients and tell us whether you like it better or worse that way. You forgot to mention that the bagels were from the famous H&H Bagels, probably the only bagel shop with its own Wikipedia entry. I am shocked you haven’t had this already. Shocked I tell ya! Will I cause you a coronary if I tell you another blend that will make you happy? Ham, thinly sliced, on top of a toasted bagel with a bit of dijon or spread of choice, top that with a thick slice of tomato and a slice of jarlsberg sprinkled with ground pepper. Broil. I could eat lox with every meal. I also like it on a bagel w/cream cheese and capers. Salty heaven. Add me to the shocked column. I remember having this for the first time at Rose’s in Portland, Ore. When I moved to NYC I ate it at least twice a month. Why not? Pingback: #23: the New York supper on Flickr - Photo Sharing!